A chic minimalist affair, The River House is a five-suite property situated by the serene banks of the Madu River and tucked away amidst lush greenery. Soulful intimacy, luxuriant suites,intimate dining and amazing serviceare the hallmarks of the offerings ofThe River House,” said Asia Leisure CEO Reyhan Morris. Asia Leisure’svision is to provide one-of-a-kindhotel experiences across a varietyof locations with focus on unique concepts, cateringto a diversity of interests and tastes of theluxury traveler. “The River House has been recognizedas one of the Most Special Escapes in theWorld by the Mr. and Mrs. Smith Hotel Awards,as well as named one of the Top 50 HoneymoonDestinations in the World by The Knot, the largestsource for wedding information,” he added. THE ELEGANCE of a bygone era – high vaultedceilings, wrap around verandahs, exotic bedspreadsand antique furniture and sculpture – artfullyblend with elegant contemporary comfortsin River House’s five suites. 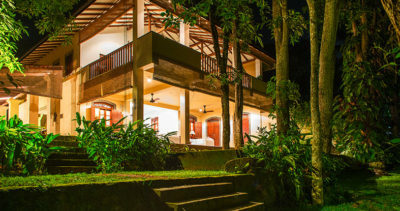 Named after rivers inSri Lanka, each suite is both a villa and sanctuaryin its own right.